PARIS - Managing director of the International Monetary Fund (IMF) Christine Lagarde was found guilty of negligence with public money in a French court on Monday in connection with an over €400 million arbitration payout to a businessman when she was France’s minister of finance. The IMF chief went on trial last week before a special tribunal, maintaining that she acted in good faith and in the interest of the public. Lagarde was not in court for the judgment. 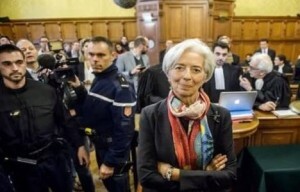 She was facing a maximum fine of €15,000 or up to one year in prison; however, despite the conviction, 60-year-old Lagarde will not be sentenced to any jail time. The court decided that she should not be punished and that the conviction would not constitute a criminal record. The court’s judgments cannot be appealed. According to the UK Telegraph newspaper, an IMF spokesman said that the body would meet soon to discuss the outcome.